Find hotel near Akhal-teke Horse Riding C ..
As the name suggests, the place is all about riding horses and enjoying the surrounding on their back. The place is located in Cappadocia region of Turkey which is known for its stunning sandy landscape. A unique place indeed, it is home to around 3 beautiful horses, all well bred, which will give you lovely rides around the suburbs of the city. Come here if you interesting in learning how to ride horses and check out the spectacular valleys and mountains surround the area, wearing your hats and boots, it will no less of an adventurous journey for anyone. 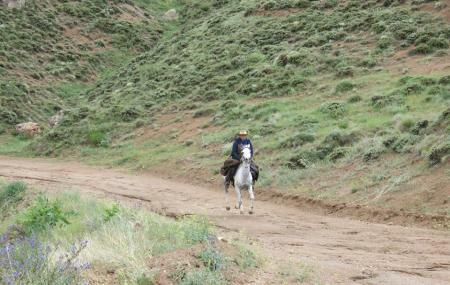 There are various endurance riding events organized by the place as well. Come with your friends and enjoy some lovely time witnessing the Turkey and its essence up and close. Your hippie side will get a lot of indulgences here! How popular is Akhal-teke Horse Riding Center? People normally club together Horseback Riding and Rose Valley while planning their visit to Akhal-teke Horse Riding Center. This is quite pricey and commercial. I suggest Körükçü House Farm instead which is 5 minutes away and a great welcoming atmosphere as a family place. Good for chilling out, green, children friendly.